Personal Panic Alarm is activated in 2 ways. If you are seeking a simple, inexpensive way to better protect yourself and want to be prepared when trouble shows up, this handheld Personal Safety Alarm provides a loud, attention-grabbing 130 dB alarm when you either pull the keychain out or press the button. The 130 decibel alarm creates just the disruption needed to help alert anybody nearby you need help. 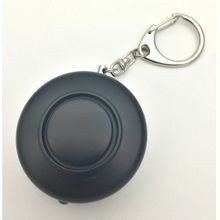 The Personal Panic Alarm easily attaches to a bag, backpack, key chain or purse for easy access. Simple to use. Easy to carry. Ready at a moment's notice.